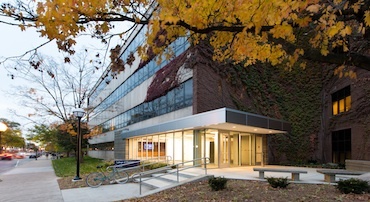 The research program of the Garner Laboratory is focused on the design of conceptually new, biomedically-relevant assays for the identification of drug-like chemical probes, with an overall goal of validating potential therapeutic targets, namely those involved in cancer and metabolic disease. Two classes of targets that we are particularly interested in are protein-protein interactions and RNAs. The study of these biomolecular entities has historically been shrouded with difficulty. As such, the pharmaceutical industry has largely ignored the investigation of these targets and deemed them as “undruggable.” However, recent advances in these fields indicate that protein-protein interactions and RNA can be modulated by small organic molecules, and as these areas mature, the opportunities for research within these fields will continue to grow. Throughout her career, Professor Garner has explored and developed the concept of harnessing the power of metal-catalyzed organic transformations to afford catalytic fluorescence signal amplification for ultrasensitive detection of biological and non-biological analytes. This capacity for signal amplification is quite powerful, and in fact, is lacking in current assays for protein-protein interactions and RNAs, which often rely on single-turnover methods such as fluorescence resonance energy transfer (FRET) and fluorescence polarization (FP). Using such methods, it is likely possible that researchers in these fields are missing many opportunities for probe discovery due to the limited sensitivity of these methods. For example, many weak binders or fragments that could be built-up as potent modulators may remain unidentified due to such assay limitations. Since protein-protein and RNA-protein interactions are challenging, yet critically important, biological targets, a paradigm shift in assay technology is necessary to enable the rapid discovery of small molecule modulators of these targets to further illuminate their potential druggability; the Garner Laboratory is working toward addressing these problems through an interdisciplinary chemical biological approach. Kravchenko, V. V.; Garner, A. L.; Mathison, J. C.; Seit-Nebi, A.; Yu, J.; Gileva, I. P.; Ulevitch, R. J.; Janda, K. D. “Facilitating Cytokine-Mediated Cancer Cell Death by Proteobacterial N-Acylhomoserine Lactones.” ACS Chem. Biol. 2013, 8, 1117-1120. Garner, A. L.; Janda, K. D. “A Small Molecule Antagonist of Ghrelin O-Acyltransferase (GOAT).” Chem. Commun. 2011, 47, 7512-7514. Garner, A. L.; Janda, K. D. “cat-ELCCA: A Robust Method to Monitor the Fatty Acid Acyltransferase Activity of Ghrelin O-Acyltransferase (GOAT).” Angew. Chem. Int. Ed. 2010, 49, 9630-9634. Gloeckner, C.; Garner, A. L.; Mersha, F.; Oksov, Y.; Tricoche, N.; Eubanks, L. M.; Lustigman, S.; Kaufmann, G. F.; Janda, K. D. “Repositioning of an Existing Drug for the Neglected Tropical Disease Onchocerciasis.” Proc. Natl. Acad. Sci., U. S. A. 2010, 107, 3424-3429. Garner, A. L.; St. Croix, C. M.; Pitt, B. R.; Leikauf, G. D.; Ando, S.; Koide, K. “Specific Fluorogenic Probes for Ozone in Biological and Atmospheric Samples” Nat. Chem. 2009, 1, 316-321.